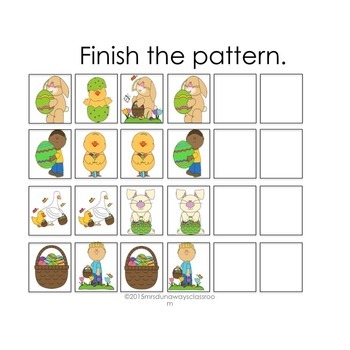 YOU CAN PURCHASE THE 20 THEMED PATTERNS SET AT MY TEACHER STORE! 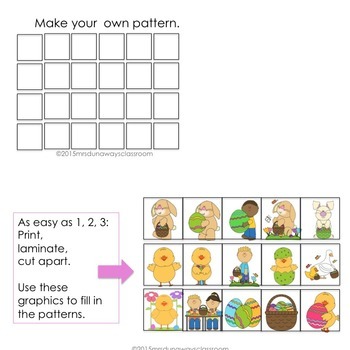 Page 2: Pattern Mat; copy on cardstock (in color) and laminate. Students will use manipulatives on next page to complete the next three objects in each pattern. Page 3: Pattern Mat; copy on cardstock (in color) and laminate. Students will use manipulatives on next page to complete the next three objects in each pattern. Page 4: Make your own pattern. Copy on cardstock and laminate. Students use manipulatives to make their own patterns. 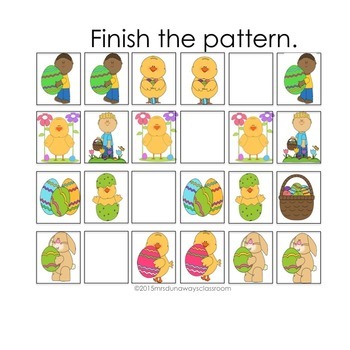 Page 5: What is missing in the pattern? Page 6: Manipulatives for Patterns. Copy on cardstock, laminate and cut apart each graphic. Store in a ziploc bag with the pattern mats. Page 7: Thanks for downloading this product. 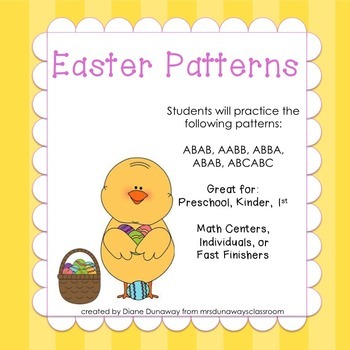 See other pattern activities at my teacher store!